Grave marker for Clyde W, Moline in Block 34 of the Cherry Grove Cemetery, Clare (Clare county), Michigan. Clyde enlisted in the Army at Kalamazoo, MI on 28 December 1942. He was later assigned to Company B, 508th PIR and participated in the jump into Normandy on D-Day. 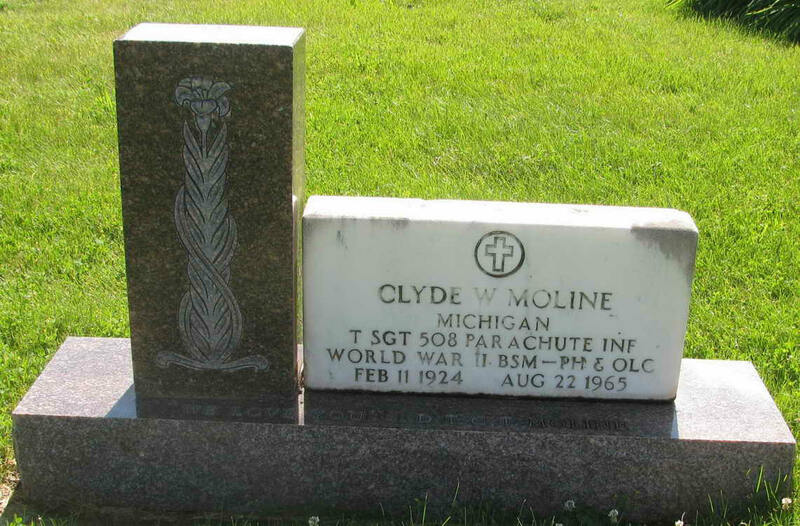 Pvt Moline was wounded in France on 9 June 1944 but remained on duty. His name appeared on a Company B Order reporting men still in service on D+33. Pvt Moline was promoted directly ro the grade of sergeant on 1 November 1944. While it is unclear whether he went into action in Holland, he did so during the Battle of The Bulge were he was wounded in action on 26 December 1944.He was able to rejoin the company on 12 January 1945. TSgt Moline's military awards include the Bronze Star Medal, the Purple Hear with one Oak Leaf Cluster, Combat Infantryman Badge and the Bronze Service Arrowhead device which was awarded for participation in Normandy assault.